1. A man takes 3 hours 45 minutes to row a boat 15 km downstream of a river and 2 hours 30 minutes to cover a distance of 5 km upstream. Find the speed of the river current in km/hr. 2. In a right angled isosceles triangle ABC, find the value of sinA + sinB + sinC. In right angle isosceles triangle, angle will be 45º, 45º and 90º. 4. In the adjoining diagram, ABCD is a rectangle with AE = EF = FB. What is the ratio of the area of the triangle ∆BCF and that of the rectangle? 5. A began a business with Rs. 1500 and B joined with Rs.2000 after few months. When did B Join, if the profit at the end of the year where divided in the ratio 3 : 2? 6. A lent Rs. 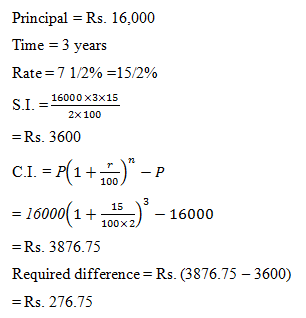 16000 on simple interest for 3 years at 7 ½ % p.a. How much more should have A gained, had A given it at compound interest at the same rate and for the same time? 7. 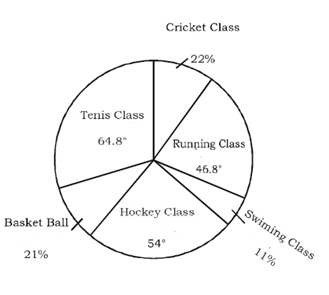 The number of student enrolled in cricket classes is what percent of that in Basket Ball classes? 8. What is the total number of student enrolled in swimming class and running class together? 9. How many students are enrolled in Hockey classes? 10. 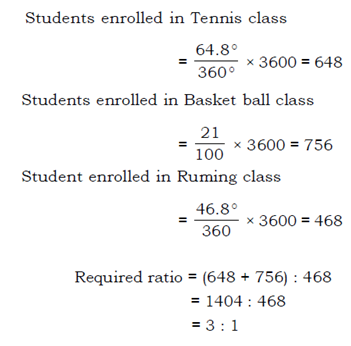 What is the ratio of the number of students enrolled in Tennis and Basket ball classes together to the number of students enrolled in running classes? 1) A man takes 3 hours 45 minutes to row a boat 15 km downstream of a river and 2 hours 30 minutes to cover a distance of 5 km upstream. Find the speed of the river current in km/hr. 2) In a right angled isosceles triangle ABC, find the value of sinA + sinB + sinC. 4) In the adjoining diagram, ABCD is a rectangle with AE = EF = FB. What is the ratio of the area of the triangle ∆BCF and that of the rectangle? 5) A began a business with Rs. 1500 and B joined with Rs.2000 after few months. When did B Join, if the profit at the end of the year where divided in the ratio 3 : 2? 6) A lent Rs. 16000 on simple interest for 3 years at 7 ½ % p.a. How much more should have A gained, had A given it at compound interest at the same rate and for the same time? (7-10)Study the pie–chart carefully and answer the questions based on it. 7) The number of student enrolled in cricket classes is what percent of that in Basket Ball classes? 8) What is the total number of student enrolled in swimming class and running class together? 9) How many students are enrolled in Hockey classes? 10) What is the ratio of the number of students enrolled in Tennis and Basket ball classes together to the number of students enrolled in running classes?